December 25, 2012 at the Center for Children's Youth Creativity "Promin" New Year party was held. Pupils together with their teachers organized a concert for the guests and parents. Also at the festival was attended by kids who attend school in the early development of the Charity Fund "Assalam". They enjoyed watching the scene, because the scene had a lot fairy tale characters, and Santa Claus with his Snegoruchkoy and Baba Yaga with frights and other equally well-known characters. 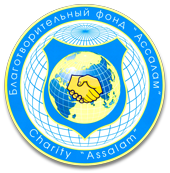 The representatives of Committee on protection of rights and freedoms of citizens "Shield" and Fund "Assalam" made a huge help in organization of the event, what they did exactly they gave sweet presents for children.